The Estate of Art Blakey is positioned to be a premiere, multi-service jazz entity dedicated to celebrating the legacy of Art Blakey and the promotion of the jazz music genre. The Estate is looking forward to the institution of a Jazz Messengers Legacy Band that will tour continuously throughout the year, collaborative projects with other organizations, Art Blakey Estate Art and Photography exhibits, as well as several other exciting initiatives. Through performance and education-based programming for a variety of audiences, and an e-commerce/e-learning presence on the Internet, The Estate of Art Blakey is poised to make an indelible impact on the jazz community and beyond. 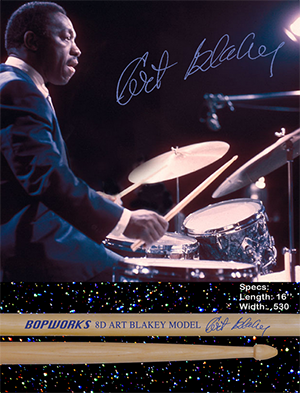 Reproduced exactly from Art's 60's model, the Art Blakey 8 D Model is 16" long with a width of .530. The longer taper and triangle tip make this stick ideal for almost any application.